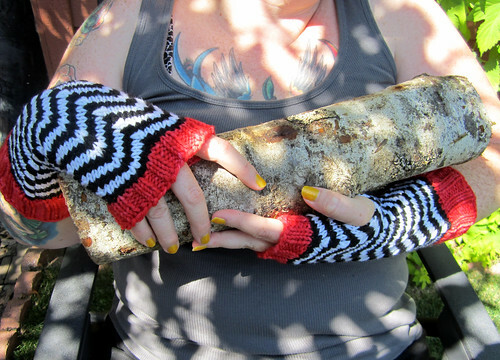 My favorite Ravelry group, Knit Knackers, holds knitting swaps fairly regurarly. The swaps are generally themed but in this last one we got to pick our own theme! 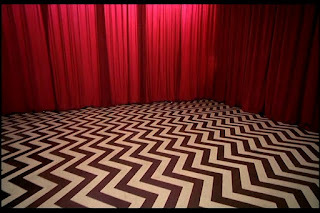 I was lucky enough to get Mary for my swap and she chose the theme Twin Peaks. 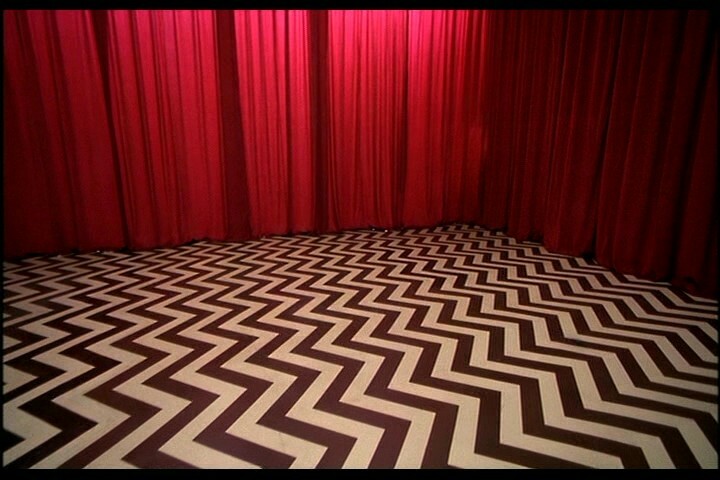 After looking at knitting patterns that would incorporate this theme, I was disappointed. So I decided to make my own pattern. 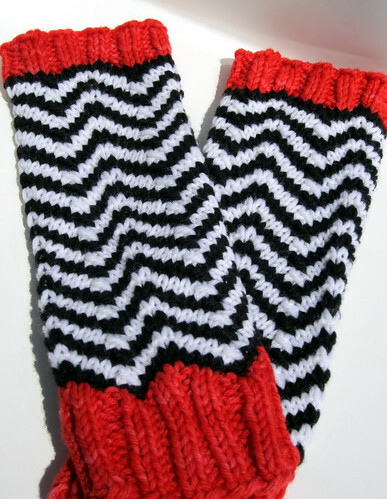 Fingerless mitts based on the Black Lodge in the television show Twin Peaks. This pattern is easy and fast! It's a great way to use up scraps as it requires less than 50 yards per color- red, white and black. The mitts are worked identically so there's no designated left or right mitt. size US 8 (5mm) needles for working in the round. Size: Women's average to large hands. Guage: 5sts per inch in 2x2 ribbing. Repeat the two rows alternating colors each time you start Row 1. With red yarn, CO 44sts. Place marker, join in round. *k2,p2* rib for 2 inches from CO edge. 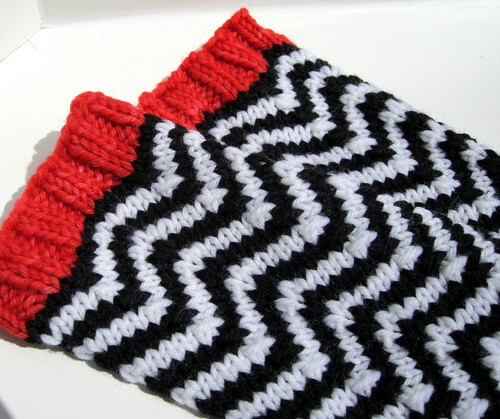 Knit the Zig Zag pattern above, switching between black and white yarn. Stop when there are 14 striped rows (28 rows total) ending with white yarn. Continue working Zig Zag pattern flat for a total of 5 striped rows (10 rows total) ending with black yarn. With white yarn, join in round. Continue the Zig Zag pattern in the round switching between white and black for a total of 4 striped rows (8 rows total) ending with black yarn. *k2,p2* rib for 1 inch. Bind off loosely in rib pattern. Weave in ends and block. Make 2. Wear them while eating cherry pie and drinking a damn good cup of coffee. Pattern is property of Maiya Becker. Do not sell pattern or sell projects made from pattern. Be cool. Are these mitts for sale?